Climate Change: The Next Generation: Peter Sinclair: Is the Polar Vortex a Product of Climate Change? Peter Sinclair: Is the Polar Vortex a Product of Climate Change? Deniers can no longer claim climate science is a subject restricted to east and west coastal elites. It has become today’s news in the Heartland. Above, Dr. Ricky Rood, formerly of NASA, now at the University of Michigan, addressed this “Arctic Oscillation” for me earlier in the year. What many of us in North America have noticed this summer, is that last winter’s atmospheric configuration, cool east, – hot, dry west, has recurred and persisted through recent months. Weather wonks, weigh in. 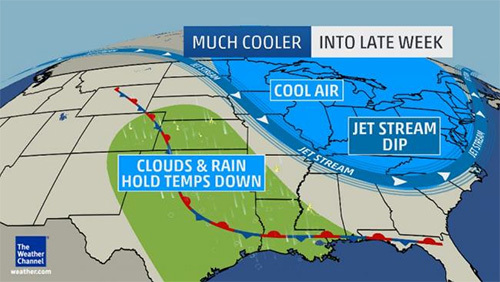 On the heels of one July polar invasion, yet another major cool down is here to wrap up July. A large southward dip in the jet stream, also known as a trough, pumped in cool air from Canada into much of the central and eastern U.S. High temperatures were more than 20 degrees below average for this time of year in some areas, and most of the region saw at least one or two days with temperatures 5 to 10 degrees below average — a noticeable difference at a time of year when many of us spend the most time outdoors. What was notable about this cool down is not just the fact that it took place in mid-summer, but that it resulted from a pattern that seemed to be frequently repeating. The same jet stream pattern this week showed up not only in mid-July, but during much of the January-June time frame as well. As a result, much of the country east of the Rockies was much cooler than average for the first half of 2014, while the West was unusually warm. WASHINGTON —Remember the polar vortex, the term some used last winter to mean the huge mass of Arctic air that can plunge much of the U.S. into the deep freeze? You might have to get used to it. A new study says that as the world gets warmer, parts of North America, Europe and Asia could see more frequent and stronger visits of that cold air. Researchers said that’s because of shrinkage in ice in the seas off Russia. Less ice would let more energy go from the ocean into the air, and that would weaken the atmospheric forces that usually keep cold air trapped in the Arctic. Normally, sea ice keeps heat energy from escaping the ocean and entering the atmosphere. When there’s less ice, more energy gets into the atmosphere and weakens the jet stream, the high-altitude river of air that usually keeps Arctic air from wandering south, said study co-author Jin-Ho Yoon of the Pacific Northwest National Laboratory in Richland, Wash. So the cold air escapes instead. Sea ice in the Arctic usually hits its low mark in September and that’s the crucial time point in terms of this study, said Mark Serreze, director of the National Snow and Ice Data Center in Boulder, Colorado. Levels reached a record low in 2012 and are slightly up this year, but only temporarily, with minimum ice extent still about 40% below 1970s levels, he said. In the study, published Tuesday in Nature Communications, scientists from South Korea and United States found that many such cold outbreaks happened a few months after unusually low sea ice levels off Russia. The study saw the same link using historical data and computer simulations, according to lead author Baek-Min Kim of the Korea Polar Research Institute. Sea ice in the Arctic reached a record low in 2012; it’s slightly up this year. 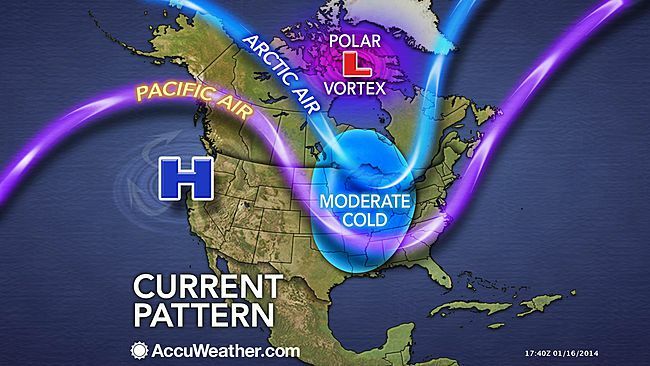 Below, my take on the California drought – and its mirror image – the Polar Vortex that froze the US east last winter. A similar pattern of cool east and hot/dry west and northwest has persisted through the summer. The video explores reasons why. If you have not seen this, do take the time now.